It was a long, cold winter, but now it's spring and things are greening up! 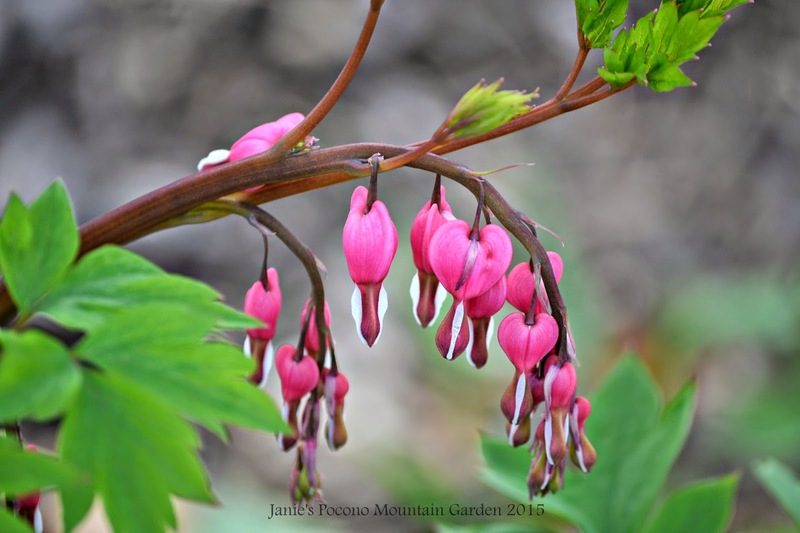 In the Pocono Mountains, though, it just takes a little longer for plants to get going. This is a Peony peeking through. I really thought it was a goner. The deer chewed it down to stubs in the summer. Now tell me, what would spring be without Daffodils? I think these are a mix of yellow and white. These are the plain, old Orange Ditch Lilies that grow wild just about anywhere they please. Some folks consider them weeds. I love them because they're spunky! They just grow ... no questions asked. Bleeding Hearts ...one of my favorite garden flowers. They look like no other flower I know. Sweet Woodruff. When they first appear in the spring they look like a swarm of tiny green ants. In late May, early June ... they are covered with little white flowers. I have this groundcover planted beneath a tall, pink bleeding heart plant. Little tufts of Columbine are beginning to sprout up here and there in my front garden. They produce enchanting flowers on on tall, willowy stems. Siberian Iris pushing up through the soil in a side garden bed. Blue-purple flowers will soon adorn the tops of tall, green stalks. Spring is the season that requires the most patience.